Congratulations to Blast 2017 and Bonner-Prendie midfielder, Paige Brady, on her commitment to play Division I lacrosse at Saint Francis University! Saint Francis is located in Loretto, Pennsylvania and is a four-year coeducational Catholic liberal arts university. As a member of the Northeast Conference, the “Red Flash” compete against Bryant, Wagner, Robert Morris, Sacred Heart, Mount St. Mary’s, Central Connecticut and LIU Brooklyn. Paige has been a member of the Philly Blast 2017 Team since the Summer of 2013. 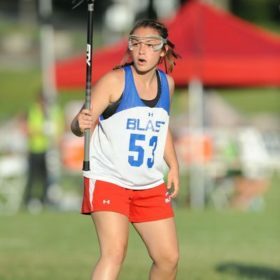 In addition to competing for Blast, Paige is also involved in campus ministry, community service club, National Honors Society and has been be a member of her high school varsity lacrosse team since freshman year. Last season, she was awarded 1st Team All-Catholic and earned Honorable Mention All-Delco. Read Paige’s full commitment story HERE.